Dr Kevin Ray Campbell was born and raised in North Carolina. He received his undergraduate degree from North Carolina State University and graduated valedictorian in 1992. He attended medical school at Wake Forest University and graduated at the top of the class in 1996. Dr Campbell trained in Internal Medicine and completed his Internship and Residency at the University of Virginia in 1999. From there, he completed fellowships in both Cardiology and Cardiac Electrophysiology at Duke University. 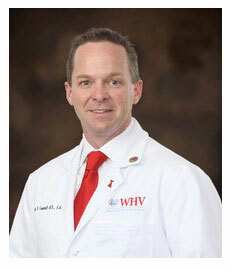 Dr Campbell joined Wake Heart and Vascular (WHV) in 2003 and became partner in 2006. He has served on the Executive Committee of the practice for 4 years. Dr. Campbell practices Cardiology and Cardiac Electrophysiology in Raleigh, Smithfield and Wilson, North Carolina. Although he treats all aspects of cardiovascular disease, he specializes in the treatment of heart rhythm disorders, including supraventricular and ventricular tachycardias as well as sudden cardiac death. Dr Campbell is a nationally recognized expert in the implantation of Pacemakers, Implantable Cardioverter-Defibrillators and Cardiac Resynchronization Devices. Beyond device implantation, Dr Campbell also performs Electrophysiology studies (EPS) and radiofrequency ablations. Dr Campbell’s passion for “serving the underserved” led to his initiative to address disparities in cardiovascular care between men and women. Data have demonstrated over the last 20 years that in the US women are more likely to die from cardiovascular disease than men. Interestingly, more men than women are aggressively treated. This information led Dr Campbell to develop relationships with OB/GYN MDs and other women’s health care professionals in order to address this growing public health problem. A nationally recognized expert in prevention of sudden cardiac death in women, Dr Campbell speaks all across the US to physicians, physicians in training, as well as civic groups. These dynamic symposia are designed to raise awareness and facilitate the diagnosis and treatment of women at risk for cardiovascular disease and death. His efforts have led to the creation of prevention programs in many cities across the US. Dr Campbell’s successes have been chronicled in the media in North Carolina and beyond and include television interviews, newspaper and magazine articles as well as a monthly call-in radio show that helps to promote these initiatives. Dr Campbell is also recognized among medical professionals as an expert in practice- building and market development. Often in high demand, he speaks nationally to physicians-in-training and helps to prepare them for the difficult task of transition to practice. In addition, he provides symposia and peer-to-peer consultation services to physicians who are either in the midst of transition or who are looking to rejuvenate their existing practices. Dr Campbell currently resides in Raleigh, NC with his wife Deborah and daughter Rebecca. In his limited spare time, Dr Campbell enjoys golfing, attending sporting events and spending time on the beautiful North Carolina coastline.